Posted on March 26, 2018 at 4:25 pm. March was a wonderful month in our Elementary Enrichment Classes. This month, students continued to hone and develop the skills learned from the previous “time traveling” months. Students investigated ancient stories, Renaissance and Impressionist artists, and developed their musical skills. Let’s take a look inside the enrichment classrooms for this month. In Music, students have been diligently practicing reading music and playing their recorders. Each student has a piece of music to practice during the week then an opportunity to perform that piece in Music class for their peers. When a student has mastered a piece, they are presented with a more challenging piece. Each of these performances have an accompanying “belt” which is tied around their recorder. Some of the songs students have been practicing are “It’s Raining, It’s Pouring,” “Hot Cross Buns,” “Gently Sleep,” “Merrily We Roll Along,” and “Ode To Joy.” These belts can be seen on their recorders in the attached picture. 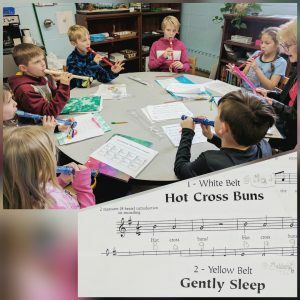 It is obvious that the students take playing the recorders very seriously, as you’ll see each student has at least 2 belts. By practicing on their own and performing in front of their peers, students are learning the life long skills of time management, concentration, and public performance. In Latin, students have been reading from scripts and putting on short plays about some well known ancient stories. These stories include “King Midas and the Golden Touch,” “Zeus and Pandora’s Box,” and “Icarus and Daedalus.” Though these titles may not seem familiar, the morals attached to them are ones the students have heard and experienced before. 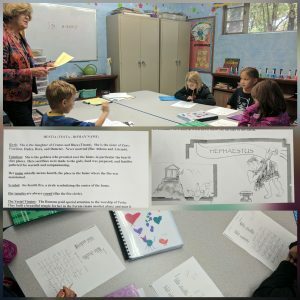 As the students read through their lines they become more connected with the characters and the outcomes, then openly discuss the decisions the characters made, why they made them, and if they have ever been in similar situations. Even though these stories are ancient and mythical, their morals still hold true to the students’ lives, and have a lot to teach us about decision making, values, and thinking ahead. In Art, students began exploring the Great Masters of Art. This started with traveling back to the Renaissance for an investigation of Michelangelo and his works. Students learned about the historical setting Michelangelo lived in, some important Renaissance vocabulary, and the very interesting logistics that went into painting The Sistine Chapel. The students tried their hand at painting upside down under a table, and began to understand the issues Michelangelo faced everyday during his four year project. Then the students turned their attention to the Impressionist movement in France and Claude Monet. 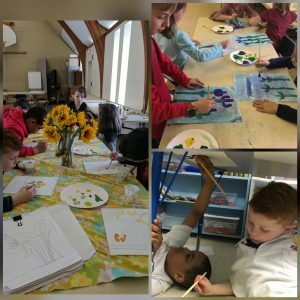 After studying brushstroke technique, color, and light, the students painted their own flowers from Monet’s garden. For this painting, students were challenged to create a large piece and fill the entire paper, just as Monet did. Next on the list of Impressionists, the students meet Vincent Van Gogh. They investigated the numerous interesting qualities that made Van Gogh so unique, as well as why he spent so much time painting flowers. After this investigation, the students held a Van Gogh art critique using official critique guidelines. The students wrapped up this month by creating their own sunflower paintings on 8×11 canvas. Even though March only had three academic weeks, the students certainly accomplished a lot in Music, Latin, and Art. Their recorder skills have greatly improved, they have looked into their own moral values through stories, and created works just like the Masters of Art before them. We can’t wait to explore what is in store for the next month’s journey in Art, Latin, and Music.